February 11, 2016, Washington, D.C.—Defiantly defending the U.S. Federal Reserve’s 3% inflation floor, Fed Chair Janet Yellen’s swatted away questions from U.S. Senators who said lower rates of inflation could be obtained safely. Yellen noted “the joke is that it takes an Act of Congress to get housing built in many cities of America—and that is what I am saying: Congress has to turn some screws to boost housing production is key metropolitan regions.” Without that, asserted Yellen, housing inflation will also boost general inflation numbers, even in a slack economy. The Fed Chair tried to unruffle Senatorial feathers by pointing out that many structural impediments are state and local government sacred cows, such as property zoning, occupational licensing, and the near-universal criminalization of push-cart vending. Where are the John Maynard Keynes’ and Milton Friedman’s when you need them? The Fed, led by Janet Yellen and Stanley Fischer, has made a huge mistake in tightening monetary policy. The other members of the FOMC are largely irrelevant noise, with the possible exception of the NY Fed’s Dudley, though all carry blame. During 2015 at first they passively tightened by merely threatening to do so, causing US economic growth to slow, and then in December actively doing so, redoubling the negative impact on US economic growth. A recession is not out of the question thanks to this highly irresponsible action. The Fed should be the most hated and ridiculed financial institution in the world at the moment but there is barely a whimper of criticism. It will come, just not yet. 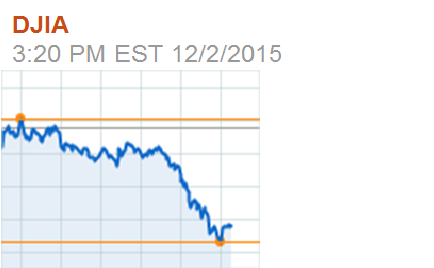 The market’s current swoon shows how it is building. What must not happen is the swoon becoming the cause of the downturn when the culprit is the Fed, front and centre, for tightening too early. Tightening too soon was always a huge risk, one we have highlighted here time and time again. Most of the Fed’s central banker peers seemed to think the Fed was doing the right thing, or at least kept quiet. Most of the economics profession seemed to do the same apart from a few exceptions, most of whom we read but no-one could say are widely read. Some, like Paul Krugman or Danny Blanchflower, are just too one-sidedly partisan to be respected across the political spectrum. Most are just not that well known. Economists in the commercial world, working for banks and companies, or industry lobby groups, also seemed to keep their heads down. Financial journalists were fairly silent too. There were a few murmurings in the blog-sphere and on Twitter but nothing very loud. Many actually agreed with the tightening, partly explaining the initial market welcome to the raise once it became clear in late October that it would happen by year end. The honeymoon hasn’t lasted long. Why are Nominal GDP growth expectations so important (again)? As Market Monetarists we think monetary policy should be guided by expectations of NGDP Growth. Expectations drive activity, economic and personal. Always have, always will. It is probably a truism. If consumers or investors expect bad outcomes they will spend or invest less. What is a bad outcome? Lower expected incomes or returns ahead. For consumers, the most brutal and feared income loss is caused by loss of work, everything else (economically-speaking) pales in comparison. Idiosyncratic or individual loss of work happens all the time of course, it is part of life. 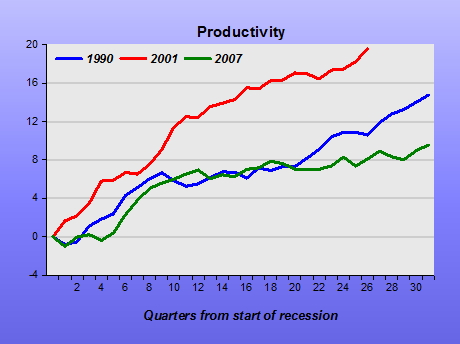 But the widespread loss of work only occurs in a recession. 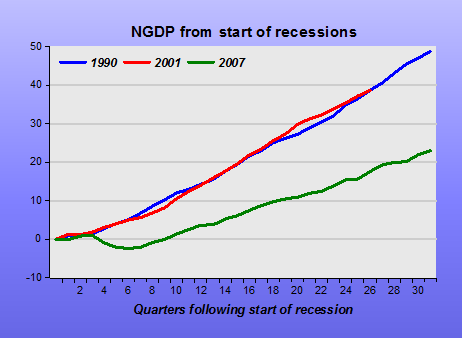 Recessions are rightly feared and should be avoided. Or if they happen that they are speedily remedied. Mass job-reducing recessions occur when business revenues are expected to fall faster than costs. 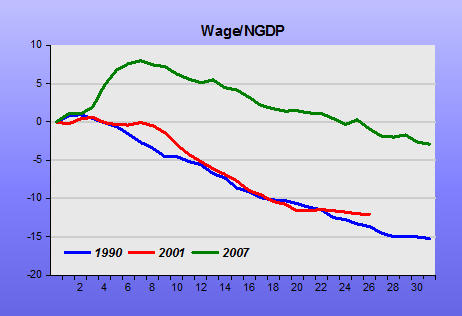 Because nominal wages are hardly ever flexible downwards jobs must be cut to save costs. The US is the most extreme example of this type of reaction as its labour laws are amongst the most flexible. This flexibility, in the long run, is a key reason why the US economy is so much stronger and the country wealthier than any other large developed nation. Highly organised European welfare-oriented countries like Germany can sometimes reduce wages via social cooperation, at least temporarily, and that can help mitigate the impact of recessions. The UK is somewhere between the two. 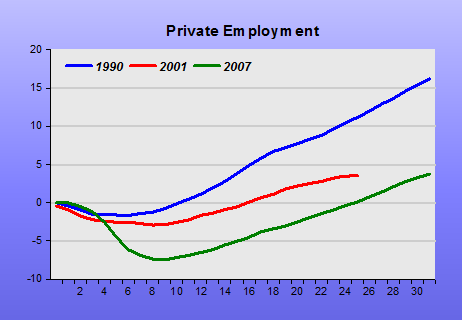 unprotected “outsiders” in the flexible private sector who see pay slashed and unemployment spike very high. Younger workers are particularly vulnerable as the insider jobs growth is reduced to zero or slightly negative and outsider jobs growth goes very negative. State and state-company pensions can then become highly political footballs too, especially when not pre-funded, as are hardly any. To avoid all this horrendous nominal adjustment, society has evolved a relatively painless way to adjust costs to weaker revenues. Macro-economists christened it “money illusion”. They did not invent it, but merely discovered it. Steady nominal growth of real growth plus (perhaps) 3% inflation gives enough room for less severe job cuts in recessions, as nominal wage increases can be limited allowing real wage cuts without people feeling too bad, i.e. far better than losing their jobs. This gentle let down allows real costs to be brought into line with weaker nominal revenues. Money illusion acts like a pain-killer, for a sick person. It is a palliative allowing the patient to get better. Using either none, or too much, is a bad thing, of course. Unfortunately, government monetary policy often gets captured by arch conservative types who think that any inflation (or use of pain-killers) is bad. Partly these conservatives are reacting to spendthrift, profligate governments who find it hard to raise enough taxes to cover their spending, and so resort to printing money instead, causing excessive inflation (over-use of pain-killers). Undoubtedly this latter problem occurs a lot, but so does the first problem, too. And this near zero-tolerance of inflation, or rather no more than near 2%, is where we are now. It seems to be a small difference, but real growth of 2-3% and inflation of 2-3% is a healthy 4-6% nominal growth allowing crucial economic flexibility. As real growth approached 0% and inflation is not allowed above 2%, nominal growth hits an inflexible 2%, denying economies crucial (real) wiggle room. In almost all modern societies the control of the money supply has become a responsibility of governments. As usual, this takeover does not guarantee success, it is merely a “theory” (aka “a hope”) that it will work better than voluntary or market arrangements. These days the theory of market failure, sponsored by socialists and government-backed economists, remains far more developed than the theory of government-failure or public choice economics. Market monetarists believe markets do better at forecasting future nominal growth than central banks. When private banks controlled the money supply they do appear to have allowed modest inflation, reacting to increases in demand for money with more money. When government-controlled central banks have been too tight with money supply, private initiatives have kicked in to offset them, but only in extreme conditions http://www.alt-m.org/2015/04/28/what-you-should-know-about-free-banking-history/ . A happy middle path of steady nominal growth for money is the most important contribution macroeconomics has made to the world, but one that is often forgotten. Steady market-expected growth in Nominal Gross National Product (or Expenditure or Income – it’s all the same thing) gives economies a fighting chance of offsetting the worst impacts of recessions. NGDP Expectations Targeting now!